Showing 1 to 10 of 14 posts. 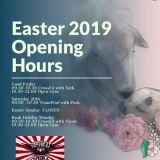 On Good Friday we are open from 09.30 for class and then Open gym until 12.00 after which we are closed for the day. Saturday is normal Team Wod, Sunday we are closed all day and Bank Holiday Monday we will have 09.30 class and then Open Gym until 12:00 and closed for the rest of the day. There are many success stories from members here at Volentia, people who join and improve their quality of life immeasurably for a whole variety of reasons. We would like to share one of those success stories with you today. It’s no longer good enough for an instructor to just be polite and professional and 'there if I need anything’. I am used to being asked about my goals, nutrition, areas to work on, mindset hacks and about me basically. Why? It’s because Volentia coaches actually care and you can’t fake that. Which pieces make up the puzzle of programming at CrossFit Volentia? We classify all of our members as athletes whatever level they are at because everyone can train in a way to develop athleticism to live a healthier more productive life be that playing with their kids or grand kids, going running with their dog or qualifying for the CrossFit games. Workouts are released online each Thursday (US time, so early Friday morning for us), and athletes have until the following Monday to submit their scores. Box etiquette and the 4 unspoken rules! You may have heard through the grapevine that CrossFit gyms generally have some unspoken rules that their members and coaches live by. Most are not set in stone, they are just good etiquette. To ensure that you aren't left red in the face next time you visit a box, here are the most common that you'll see. If you want to see major results from your training, you will need to back it up with good and consistent nutrition. This combined with regular doses of good quality sleep and recovery will see you reaching your goals more effectively. I worked harder in that 10 minutes than I ever thought possible! I’m older, for sure! But I’m stronger, faster, leaner and more motivated in my training that EVER before! Hey look… another goal setting blog post! Its no secret, I quite like a goal. They give you a direction, a purpose, a deadline and something to be accountable to.